The level-3 products produced by NASA's Ocean Biology processing Group comprise level-2 data that have been spatially and temporally aggregated after being filtered to exclude unwanted values. Here follows a description of the spatial aggregation — or binning — method that we currently use. For the purposes of this explanation, let us choose a bin size such that each bin spans ten degrees of latitude from south to north. The bins of such a scheme — shown in Figure 1 — are much larger than those we use for any of the data sets in our archive, but that makes them big enough to see in a small map of the world, and the basic construction of the bins is the same as for higher-resolution / smaller-bin arrangements. the division of the two polar rows into three bins each. The above figure shows the sinusoidal nature of our chosen binning scheme in that the number of bins in each row is reduced by the cosine of the latitude as one moves north or south of the equator. Where it differs from a straight sinusoidal projection is in the rounding that occurs when determining how many bins a given row should be divided into. This rounding is necessary to avoid fractional bins at the ends of rows, but it does introduce a small departure from area equality among bins from different rows. A further small departure from area equality is introduced by the fact that we assume a spherical Earth instead of using a more precise ellipsoidal model when we lay out our bin boundaries. Figure 2 , below, provides a polar view of the layout of level-3 bins. 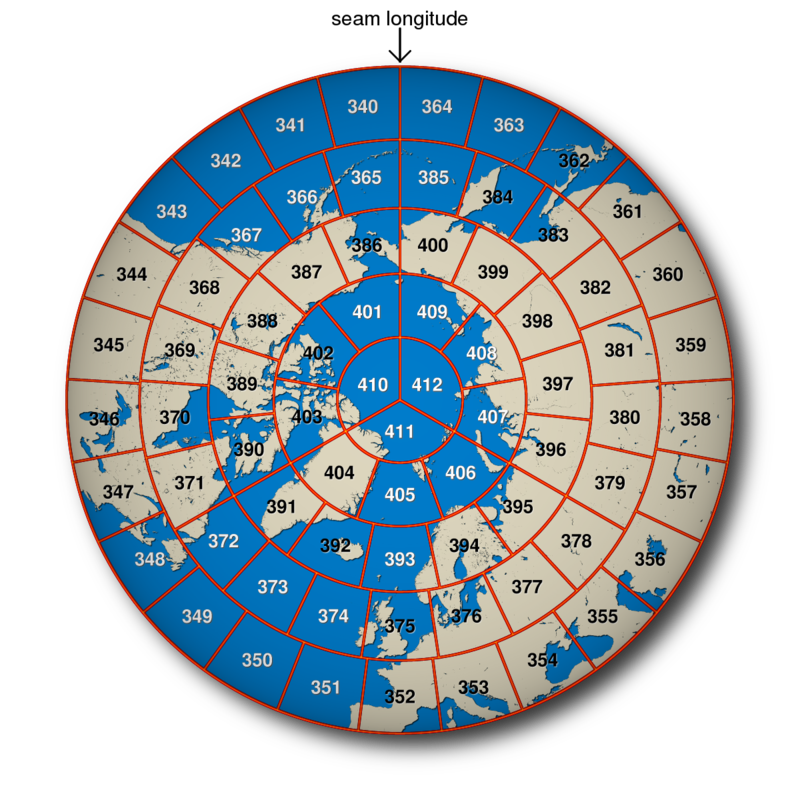 Polar stereographic maps of the Earth showing 10° bin boundaries and bin numbers around the north and south poles. The antimeridian is indicated as "seam longitude". The level-3 bin files that we currently distribute come in one of three resolutions. As hinted at before, the chosen resolution depends somewhat on the mission. The following table summarizes our level-3 resolutions. *Area computations are based on a spherical Earth having a radius of 6378.145 kilometers. 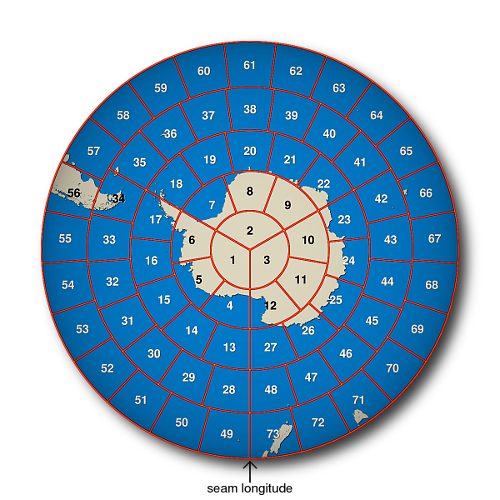 One degree (or 111 kilometers) is the bin dimension chosen for the Aquarius mission. This binning scheme has 180 rows. 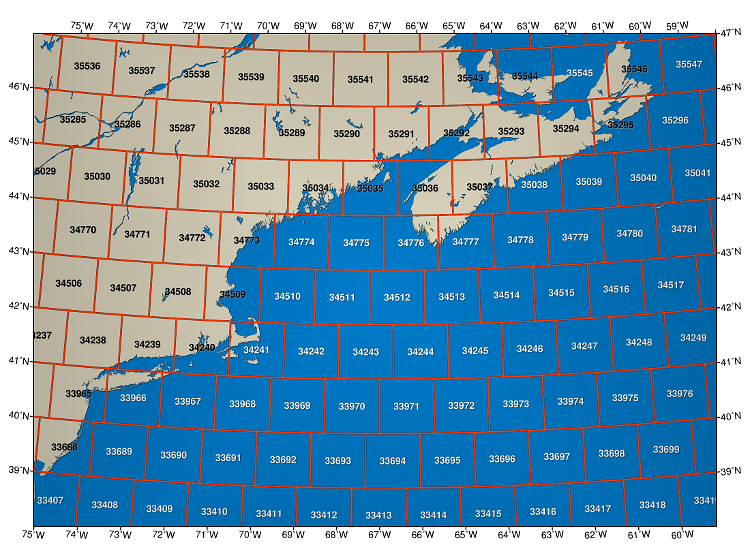 Figure 3 shows the size and orientation of these bins over the northwestern Atlantic Ocean. Albers conic equal area map of the northwestern Atlantic showing 1° bin boundaries and bin numbers as used by the Aquarius mission. 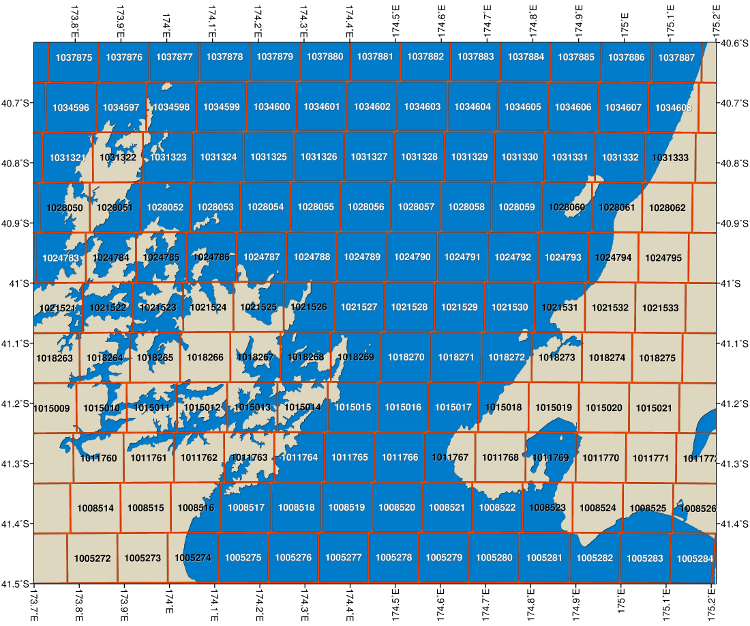 We divide the Earth up into 2160 latitudinal rows for the SeaWiFS mission. For our spherical Earth having a radius of 6378.145 kilometers, this results in an average bin width of 9.28 kilometers. Figure 4 shows the size and orientation of these bins over New Zealand's Cook Strait. Lambert azimuthal equal area map of New Zealand's Cook Strait showing 9.28-kilometer bin boundaries and bin numbers as used by the SeaWiFS and ADEOS/OCTS mission. Double the number of latitudinal rows to 4320, and you get the 4.64-kilometer bin size that we use for the MODIS missions. 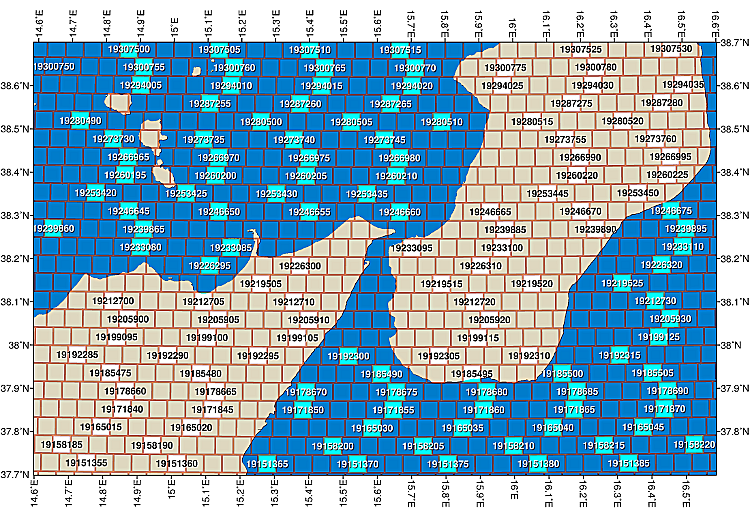 Figure 5 shows the size and orientation of such bins around the Strait of Messina. Lambert azimuthal equal area map of portions of the Italian regions, Sicily and Calabria, showing 4.64-kilometer bin boundaries and bin numbers for selected, highlighted bins as used by the MODIS and other missions. Note that computer rounding errors can become significant at higher bin resolutions (smaller bin sizes). You can get different bin numbers for the same geographic coordinates if you perform your computations using 32-bit arithmetic and then repeat the computation using 64-bit arithmetic. 64-bit arithmetic was used in the preparation of the above figures. A set of Perl subroutines are provided below as an illustration of the steps needed to convert back and forth between geographic coordinates and level-3 bin numbers. The variable names used are similar to those given in Appendix A of NASA Technical Memorandum 104566, Vol. 32 . To use the following subroutines, one would call initbin once with the number of rows in the desired bin resolution. Then one could call latlon2bin or bin2latlon as often as needed to convert a latitude/longitude pair to a bin number or a bin number to a center latitude/longitude. The bin2bounds subroutine will return the bounding latitudes and longitudes for any given bin number should you wish to plot bin outlines as in the above figures. # Level-3 SeaWiFS Data Products: Spatial and Temporal Binning Algorithms.